It’s Oktoberfest in Germany and there's a festive Oktoberfest atmosphere at Jackpot Capital Casino this week too! 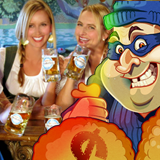 The popular casino featuring games from Realtime Gaming has lots of Oktoberfest bonus cash to give away and they're including free spins on one of their most popular online slots, Cash Bandits 2. Jackpot Capital Casino celebrates Oktoberfest with casino bonuses and free spins (until October 2, 2017). Jackpot Capital players have been having a lot of fun on the new Cash Bandits 2 slot since it arrived. The sneaky gangsters that we loved in the first Cash Bandits slot game are on the loose again in Cash Bandits 2. Like the original game, the Wild is an Expanding Wild. But in the new game it can appear on any of the five reels, not just the middle reel. In the bonus game, you'll crack a safe to win up to 50 free spins with up to 5X multipliers. Available September 28 until October 2, 2017 only. Jackpot Capital has hundreds of real money online casino games from RTG. Its newest slot game, Dragon Orb, has a sticky Expanding Wilds and two progressive jackpots. This Friday Happy Hour -- Free Blackjack!